It started with a simple question, then grew into a large online survey with responses from over 1,000 people from across the U.S. and abroad. A new book by Ellen Riggle and Sharon Rostosky, “A Positive View of LGBTQ: Embracing Identity and Cultivating Well-Being," explores what’s positive about lesbian, gay, bisexual, transgender and queer identities. “It is the right question at the right time. People want to share their positive experiences,” said Riggle, UK professor in the departments of Gender and Women’s Studies and Political Science. 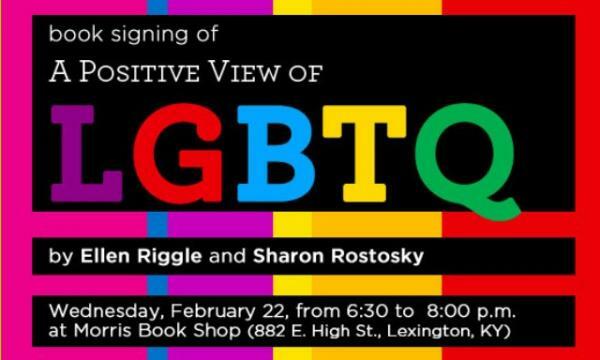 Riggle and Rostosky, professor in the Department of Educational, School and Counseling Psychology in the UK College of Education, will hold a signing for their new book from 6:30-8 p.m. Wednesday, Feb. 22, at the Morris Book Shop, 882 East High St., Lexington, Ky.
What was expected to be a small project attracted such an inspiring amount of positive feedback from the community, that the authors wanted to share the stories with a broad audience. Using personal narratives from their research, the book focuses on how LGBTQ-identified individuals can cultivate a sense of well-being and a personal identity that allows them to flourish in all areas of life. The stories in the book are organized into eight themes that illustrate how a sense of well-being is connected to living an authentic life, forming strong relationships, having compassion for others, fighting for social justice and feeling a part of a larger community. Each chapter has activities to inspire readers to create their own positive narratives. “A Positive View of LGBTQ” is available locally at the Morris Book Shop and online at Amazon.com. For more information about the book or its authors visit www.PrismResearch.org.